Most people locally and across the nation know how to use enchilada sauce for enchiladas. 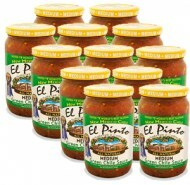 However, El Pinto Enchilada Sauce, also known as Red Chile Sauce is great for a lot of other meals as well. El Pinto's Executive Chef walks you through a simple video recipe that uses Red Chile Sauce for a extremly quick and amazingly tasty marinade using ingredients most likely already in your kitchen. El Pinto's Red Chile (Enchilada) sauce is unique to other brands in the quality of the New Mexico chile we use and authentic hand-peeling techniques to process it. The only ingredients are red chile, a touch of sunflower or soybean oil, cornstarch to make it gluten free, garlic and a natural preservative. Enjoy El Pinto Red Chile (Enchilada) Sauce for a gluten free meal tonight. It is available at thousands of stores nationwide, but if it is not in yours, order online direct from El Pinto.